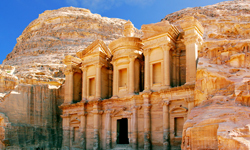 Be treated to the very best sights that Jordan has to offer. Starting out from the capital, Amman, travel back in time to explore the astounding ruins left behind by the Nabateans who build the ‘Rose City’ Petra. Travel the deep rocky canyon to look upon some of the finest architectural sights to be found in the Middle East. On Mt. Nebo, stand on the site where Moses is thought to be buried. Then visit the Christian city of Madaba with its beautiful mosaics, dating back to the Byzantium era. At Jerash admire the paved and colonnaded streets, spacious public Squares and public Baths built at the height of the Roman Empire. Upon arrival, our locally appointed representative will meet you at Queen Alia International Airport and provide assistance with customs and immigration procedures. A private transfer to your selected hotel in Amman. Following breakfast enjoy a morning city tour of Amman. Visit the ruins of the Amman amphitheatre, the citadel and the Ummayad Palace. Later, travel south to Wadi Rum Desert. Lunch will be at the rest house followed by a jeep tour inside the Wadi. Watch the spectacular sunset over the desert as you enjoy a cup of traditional Bedouin tea. Then depart for Petra and on arrival check-in at your selected hotel. The visit to the ancient Nabatean Capital starts on horseback, followed by a walk through the Siq, a long narrow fissure between two overhanging cliffs. As the tour proceeds, the mysteries of Petra, the ‘Rose City’, gradually unfold. See the spectacular Treasury, the Royal Tombs, burial chambers and high places of sacrifice. Lunch will be in the Old City. 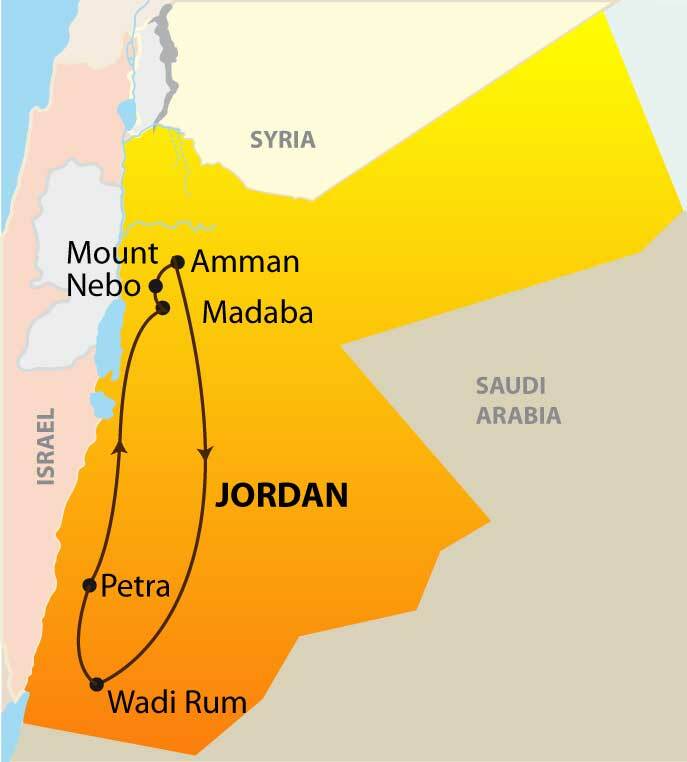 Today, travel to Mount Nebo to see its ancient Monastery and enjoy wonderful views of the Jordan Valley. Next visit ‘Mosaic’ city of Madaba. The last stop of the day is at the Graeco-Roman city of Jerash with its magnificent ruins. Lunch will be at the Green Valley Restaurant before heading down to the Dead Sea. Check-in at your selected hotel. Following breakfast, check-out and depart for Amman’s Queen Alia International Airport. Assistance with check-in formalities for your onward flight.